If you're selling a product or service online, you need affiliates. Quite simply, affiliates are the key towards that million-dollar payday. Who wouldn't want a battalion of thousands of affiliates who will help sell their products on the World Wide Web? Easy 7 Affiliate Marketing is an excellent resource that you can give away to people to make them become better affiliates. You can even give it to people who don't know anything about affiliate marketing and this resource will turn them into capable affiliates in 7 very easy steps. 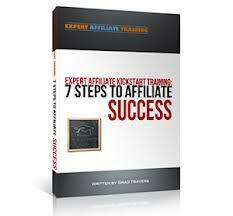 The seven step plan to affiliate marketing success. Follow this, and focus on one topic at a time, and you will succeed online. Secrets that gurus typically don’t reveal in free reports. Much more ( will leave it to you to discover ). This report is 38 pages in length, but an easy read by itself. So, download it, grab your favorite beverage and print it out and read it.